Chimney leak repair and waterproofing are recommended if you notice leaks with your fireplace or chimney. Ignoring a chimney or fireplace leak will cost you more to repair as damage worsens over time. For commercial chimney leak repair service in New York, call Chimney Repair NY at 1-516-279-1513 or request a Free Chimney Leak Repair Estimate. Water is a chimneys worst enemy and it causes more damage to chimneys and masonry than chimney fires. Water gets trapped between brick and mortar joints and freeze when temperatures drop. As water inside the joints freeze, it expands and causes bricks to loosen and crack. We repair chimney leaks for all building types and industries including commercial buildings, condos, Co-op buildings, healthcare offices, apartment buildings, hospitals, schools, banks, government buildings, industrial buildings, and commercial offices. 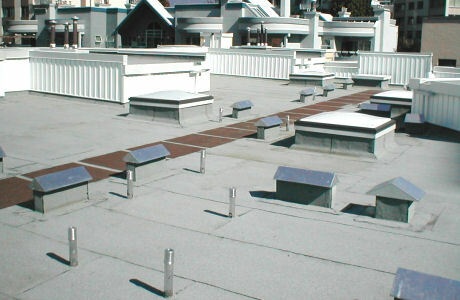 Chimney Repair NY can repair any of your commercial chimney leaks. Call 1-516-279-1513 for service or request a Free Commercial Chimney Leak Repair Quote. We are committed to providing clients with the highest level of quality service and guarantee every job is done properly. We are a full service Commercial Chimney and Masonry Company that specializes in commercial chimney leak repair, brickwork, and chimney repairs for Manhattan, Long Island, Westchester, Brooklyn, Queens, Bronx, Nassau County, Suffolk County, White Plains, and Yonkers, New York. Call us today 1-516-279-1513 for more information about our commercial chimney leak repair and chimney maintenance services.